Having introduced and briefly discussed the existence of Energy Gates in space and time, it now seems fitting for us to provide some additional insight into what it is like traveling within the Multiverse. In Trans-Portals 1, we touched upon the idea that each of you is already moving around inter-dimensionally everyday---though you often do not realize it. The telltale signs of decomposition and recomposition, which accompany transits from universe to universe, are often cloaked to keep you from being distracted by the expansive nature of who you are and what you have been doing! We are about to change that. Now is the time to assume your rightful position as Co-Pilot of the Multidimensional Ship. Now is your time of fond rememberance---with fulfillment through infinite joy! It has been popularly said that "The truth is out there." And so it is. But how does a person get "out there" to get at it? Many of you have been experimenting faithfully to find your own ways to do just that. The conceptual model of creating an "Out of Body Experience" (OBE) has often been a suitable vehicle for gaining understanding of these areas. With those journeys, you allow yourselves to leap out of the "box," while still maintaining your sense of separation from the rest of All That is. But now, you have the opportunity to become engaged in something much bigger, something more comprehensive than ever before. Even as the (still valid) model of reincarnation has been fulfilled and expanded by your growing awareness of simultaneous parallel existence (multiplicity)---so now can the concept of Astral Travel be upgraded, if you wish, to an experience we call INTER-DIMENSIONAL TRANSPOSITION. What is the shortest path from anywhere to anywhere else? As the crow flies? Not really, although it may seem so. There is now an even quicker, easier way for a person to move around the Multiverse. All he needs to do is CHANGE HIS IDENTIFICATION OF "SELF" from one reality context to another. The appropriate images and icons are already there, in the alternative locale, so there would be no need to vacate one existence in order to visit another. In fact, the leap is even more compelling when you do not. During this current upgrade, the experience of lifting out of a physical body will often be replaced by a calm realization that it is *all* your body. Decomposition and Recomposition may not even need to apply. And this confidence will serve as a streamlined version of the "silver cord" which once seemed so important during an OBE. Each of you who travels is sustained by the knowledge that everything and everyone is but an single aspect of you. Microphones and electric guitars are now cordless, why can't you be? It can certainly appear, for example, as though your many "lives" are concurrent TV shows that are being filmed all in the same studio, but in different parts of the building. Inside the Director's Booth, there are many screens, visible only to the production staff. When the time for a shift comes, the Director makes the call---and camera one switches to camera two, though the Audience remains the same. Understand, then, that each of you is your own Director, Actors, Production Staff, and Audience---all gathered into one. There are Trans-Portals that connect person to person, place to place---monitorable through the Gateway of your Imagination. Anyone can do this, but not everyone believes in the impressions that come. The Imagination has been greatly discounted during this passing Age of Reason. Whenever this important faculty is allowed to come back online, some people get scared by it, and think they've lost their mind. Actually, the opposite is true! A valid part of the mind, which once was lost, is finally returning. And what a gift it brings! Some people are primarily visual, others travel on waves of sound, and still others take sentient journeys through space and time. A leap through a Portal can happen over several minutes, or it can be completed in the twinkling of an eye. Some people register "time loss," while others edit out all memory of the trip. As we said earlier, the vividness of the experience is not the issue. The fact is that you went, you came back, and you probably have a story to tell. Why don't you sit down with a piece of paper and let yourself tell it? That is, in fact, the very method in which we have grown in our connection with this physical channel. When a viewpoint refocuses, from the players to that of the Expanded Self, this is called a PHASE SHIFT. Micro becomes macro, and consciousness gets activated up and down the energy spectrum. What we are describing here need not exclude an OBE, or any other helpful Astral Experience. Reconnection is about getting back what you once were and recovering what you voluntarily laid aside to enter this World of Form. The Ascension Process, currently being enacted on Planet Earth, is a systematic series of Phase Shifts---back and forth---until all levels of the Oneself Consciousness have learned to "walk in each other's shoes." The important thing to remember is to not get too attached with how your evolution is supposed to look. The world is replete with books, tapes, videos, and trainings of all kinds---designed to assist you in the process of being mystical and magical. These various "tools," including our very Transmissions, are offered as "dress rehearsals," for the sacred time when you, yourself, will generate the exact coordinates that will lead you home. 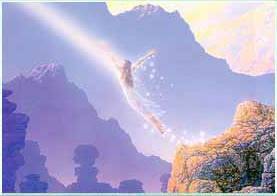 Speaking of transitional reality "tools," like OBEs........we tell you now that the phenomenon known as Lucid Dreaming was and is a prototype for Meta-Reality---which is the Astral Bridge that is used for walking between the worlds. In days past, when an individual traversed the Bridge, he would encounter a person who would declare: "This is just a dream." In this way, he could keep his nervous system from being completely blown by the experience. But now, there is no need to insulate yourselves from what is happening. You are doing this, you have been doing it for a long time, and you will be doing ever so much more in days to come. Therefore, expect to begin integrating "flashbacks" and "flash-forwards" into your daily 3D life. Having entered the Photon Belt sometime back, your planet is already wired for playing around in time. You're no longer in Kansas anymore, Dorothy. Congruity in life is now entirely optional, and it is frequently discarded in favor of energetic activation or just plain fun! We are speaking here about an upgraded version of what you have called "Deja Vu." The exact faces and locales may vary, but the base energy will be duplicate other times and places. The individual players, the themes being explored, are Multidimensional. Your review of these "snapshots of experience" is added simply as a tool for your education concerning this. Treat it as such, and enjoy! Another form of Trans-Port involves capturing the essence of someone or something that is "there" and moving it to "here." In short, the Prophet no longer needs to go to the mountain. Now he can call for the mountain to come to him. This operation is a bit trickier, but ever so much fun. different life forms at this point in history. The Physical Dimensions are becoming a primary meeting place for the Celestial and the Internal Realms, also known as the Underworld. There are "meeting rooms" here where Inter-Dimensional Delegates can share their intrinsic worth with each other, without losing the purity of who and what they are. The Archetypes who administrate the absolute levels of those realms will never actually meet, except through each of YOU. Your individual and mass consciousness is becoming a cauldron, into which is being poured all the best and most dynamic elements of Light and Dark, Form and Void, God and Goddess. Going UP in vibration, you have access to Logic (Logos)---the Realm of Pure Idea. Moving DOWN the scale will bring you into Realms of Pure Emotion and Passion (Pathos). In Oneness, neither supercedes or dominates the other. A Guardian Spirit guarantees this. At present, your planet is moving rapidly towards what is called "The Edge of Here and Now" which is neither up nor down, but a point between. From this point, your various Delegations will have access to everything, and be limited to nothing. From the Realm of Infinite Possibility (R.I.P. ), will come your "mountains" to visit. They will most often be wearing modern garb, and will seem to be deeply involved in today's business. Your challenge will be in recognizing them. Some very dynamic individuals traverse the Portals regularly, disguised as ordinary folk, while others prefer to assume the form of inanimate objects or animals. All your "witnesses" are watching, waiting for the time when your perceptual skills sharpen, and your awareness begins to call them forth---like genies from a bottle. All are here to help, during this powerful time on the planet. Each Energy Gate opens into a CLOSET, or passageway, which connects to many realities. You, My Dear Friends, are the BRIDGE PEOPLE. You are closets, with two doors. One door opens into your physical universe, and the other opens into the Multiverse. Between them, there is a kind of "buffer zone" which modulates and integrates the energies so that they can move freely between the worlds. You might say that this closet is HERMETICALLY SEALED..........which recalls the energy of HERMES, who is the "Messenger God," famous for His ability to move freely between Heaven, Earth, and the Underworld. He is the patron of Alchemy, which is a key component of the process into which we initiate you at this time. Though many conceptual frameworks have been developed to examine and explain Energy Anatomy, we would like to encourage you to apply your working knowledge of the computer, especially your knowledge of online interactions, in order to visualize how human consciousness flows and functions. You did not develop this cyber technology from nothing. Actually, you remembered it by taking what you instinctively knew about your own inner processes and distilling them within certain machines---thereby separating your awesome creative power from yourselves, while still retaining access to it. Your computer monitor can be seen as a microcosm for your scope of perceptual reality. In fact, if you sit in front of it long enough, your brain actually begins to believe that you live within this box! Your cursor is correspondent to your focus of attention. When you move your focus around any physical reality, it creates energetic links with what is seen there. You can right click or left click on what you see---thereby making instant decisions about whether you want to open to it, save it, or delete it from your awareness and your world. Translation of self, objects, and physical situations will one day be accomplished by highlighting, cutting, and pasting visible data that will lay itself out like so many pieces of Cosmic Clip Art. Simple? Yes, indeed. Easy? Not always. There are viruses that can get into your programs and slow you down, or even cause your systems to crash. For the most part, these consist of implanted doubts and hesitations about whether or not you *really are* what your Inner Guidance seems to be telling you is true. Though dealing with these "implants" can be bothersome, you will not be ultimately defeated. In fact, learning to navigate and filter those pesky "pop-up screens" and "error messages" increases your skill, and separates the "novices from the masters" in the world of Spirit Work. Mostly, they simply exist to regulate the timing of your remembrance and personal unfoldment. There is an aspect of each one of you who functions just outside of your perceptual "box," just as there is a person whose fingers now dance upon the keyboard of the computer which is in front of you now. Both are fully YOU--- the physical "hardware," as well as the operator who is using it. They are just different levels of you. The harmonization of the Sovereignty of God and the freewill of man is now found in Reconnection. A glove cannot move without the hand which fills it. But you and that hand are one and the same. Believe that, and many of your fears and hesitations will melt away. Remember also that all time is NOW. There is no such thing as pre-destination. All creation, everywhere, takes place within the same NOW Moment. Each level of the Oneself moves synchronous with all the others, even though it may be veiled and limited in awareness. You do not encounter these "bridge concepts" until it is time for you to awaken. The proof that you are ready to begin traversing the Portals consists entirely of the fact that you are here---that you have received these transmissions, and that you have a desire to begin journeying. You could not have found them if you were not ready. However, you can easily forget this knowledge if that is what you wish. Desire is the first, and most important activation key. Close behind that is a willingness to be changed and expanded. Waiting to be Ready" is the name of the Game being played out in your dimension right now. Not everyone is ready to expand, and many who are tend to form attachments with others who aren't. It's a curious situation, because each "side" of those reflections in the cosmic mirror seems intent upon controlling the other! To break free from this conundrum, someone will need to own all sides as One. Own it all, and cease trying to control the "outside world." It isn't "outside" at all. It is all happening within. We simply must say this again. Do not judge the integrity or extent of your travel within the Multiverse by how many "exotic experiences" you can remember. Just because you don't have memory of rising out of your body doesn't mean that you don't Astrally Travel. In fact, those who have the most definitive, tangible "experiences" are usually those who need them in order to believe, or to help others believe. The rest of you have already accepted that you are Astral-nauts, and simply don't need more proof. Realize again that each person, object, or physical situation in your reality is an aspect of you. We refer to them as "frags," short for "fragments." As your cursor moves around the screen, there will be many processes that appear to be underway. You are all multi-tasking, and very thorough in your exploration. If one of your "frags" comes up to you and says: "Boy! Did I have a dream last night! ".......listen closely. That person is part of YOU, describing a real journey you have taken. Take it in, and begin mixing and mingling that information within your knowledge of who and what you are. The same is true of movies, magazines, TV, and all other forms of visual, auditory, and kinesthetic art and information. We refer to these elements as " The Dreams of the Mass Mind," since their creation is almost entirely predicated on what symbols and depictions will most likely be embraced commercially by humanity. In this way, personal greed or desire for ego advancement can be a purifying factor for your dream. Madison Avenue, and other such agencies, absolutely NEED to touch and affect you deeply. Therefore, their estimations of what excites you will probably be dead on---though they are only one level of the many tools you are now using to reconnect. We have spoken earlier about your diminishing need for tangible "proof," concerning the extent of your Astral Travels, and to provide validation for your transit through the Portals. Many of you are now ready to accept that these things are happening, and that you are Spiritual Masters in every sense of the word. Let us speak now about your generation's diminishing need for physical detail. The 3D world is currently built upon a conceptual template that is founded upon the words "I AM." To have an identity here, you must ascribe to yourself certain characteristics and attributes which form an identity, a Signature of sorts, that can exist within the parameters of an established reality base. The energy signature for the Multiverse is lighter and more porous than that. It is built upon the words "Suppose I were..........," and deals more with potentialities than actuality. It is the INDEX PAGE for All That Is, while each discrete universe embodies a "chapter" in the Grand Book of Life. The more you concentrate upon where you have been, what you now are, or what you earnestly desire to be, the more you are operating within the spiritual frequency of "I AM." The more details you ascribe to yourself, and require---the denser your conception of yourself will be. There is no problem in this, if self actualization is what you have left on your itinerary of evolution. However, if freely traversing the Portals is now the object of your desire, some ballast has to be dropped from your boat, so that you can attain the speed required to make the journey. To abbreviate a word, a person removes as many unnecessary letters as he can while still retaining a sense of what that word is. Abbreviance is the conscious ability to look ahead and "fill in the blanks," rather than to rely upon explicit detailed descriptions of what is happening. Do you currently finish other people's sentences before they complete their communications with you? Do you have a growing impatience with waiting inlines, stopping in traffic, and speaking in explicit ways and formats? If your answer is yes, you are now in the process of installing the Abbreviance Software onto your inner computer. Throughout your current physical universe---people are learning how to arrive faster, turn on a dime, and depart without leaving a trace. Some of this is simply due to planetary infiltration by denizens of the Dark Realms, who are trying to play in your reality without getting caught in the system. Those of them who do get hooked have been "milked" for information about what it means to move around, as it were, "between the lines." Some of those insights we are sharing with you now. Even as your physical world is virtually awash with the availability of physical details, people are overlooking them more and more. Jumping to conclusions is becoming a worldwide sport! Have you noticed how your computer software will actually finish familiar words for you, once you begin to type them? Your own minds are also doing that. Little by little, the planet is developing a UNIVERSAL TONAL VOCABULARY---consisting of physical symbols, sounds, colors, words, and phrases that immediately invoke virtually the same inner experiences, whenever they appear. Indeed, there will be a time when your "updated version" of physical reality will be compacted to include only icons and folders that indicate possible manifestations that are available for personal exploration. The worlds that function just beyond this current vibration appear very different than what you are accustomed to seeing now. Having let go of your need for continuity, exact definition, and intricate detail, your perceptual field will somewhat resemble a desktop on Windows 2000. In place of mountains and flowers, trees and oceans, there will be geometric symbols and (thumbnails) that will need to be selected and "clicked upon" before the details begin coming up on the screen of your conscious mind. However, once chosen and expanded, each "file" contains a vast selection of alternative versions of that selected subject---all neatly catalogued for instant retrieval. All of this lies just beyond the Veil. Many of you are seeing it now, in bits and pieces, and have not been able to make the connection between your computer systems and this focused array of physical possibility. After all, they are not exactly the same---merely similar in design and function. Soon you will have monitors and teachers, who will assist you in operating your new equipment. Remember, nothing will be lost in this process---except the impression that you are held prisoner within a defined space. Trans-Portals will change all that.........as you will soon discover. In order to traverse the Trans-Portals consciously, a person simply needs to examine where he is, and commit his conception of self from there to the R.I.P. (Realm of Infinite Possibility). Some of your spiritual belief systems have likened this experience to dying. And, indeed, within what you have called "other incarnations," you waited until that experience called "death" to allow us to de-program you from the Limitation Focus. Do you think that you are something? Then you are attached to what you think you are. Do you think that you are nothing? Then you are attached to what you think you aren't. It is only when you realize that you are *everything* that you can finally let go. This holding on has been your safety harness, while living within these physical dimensions. But it can become a prison for those who find they cannot let go. Do you doubt that the Earth is a prison? Why, then, do you think it is that the basic elements of construction here are called "cells?" But you are only as imprisoned as you have decided you will be. You are the only accuser, judge, and jailer that ever counted within your life's program. There is none else. You can turn the key and escape anytime you wish, but all change invokes consequences. To turn your activation key, you must become willing to CHANNEL YOUR LIFE, in the same way you have seen Trance Mediums channel their "spirits" for financial gain. What does it mean to channel your life? It means letting energies out of your "closet" which you have held back because you wondered how others would receive them. What you have previously referred to as a "Trance Channel" is a person who holds within himself sufficient trust in his "Source" that he will simply move over and allow that energy to drive his physical vehicle. In essence, he sort of "sits in the back seat" during the channeling session. A Conscious Channel does that as well, but in a whole new way. Instead of "moving out," a Conscious Channel will stay around and serve as a DOORMAN for the entities and inner universes he decides to sponsor into his universe. He will be like "Ed Sullivan," introducing each performer as they all move to center stage. Indeed, it will be his apparent comfort with these energies that will encourage others to trust them too. As he sees their trust and transformation, due to their collaborative "work," he will love himself more deeply than ever before. Though not all of you will choose to make Channeling your profession, you must all learn to do it, in a rudimentary way, if you are to traverse the Portals. What does it mean to Channel? It means to allow your body, your mouth, and your awareness move in those ways that you most want to move---regardless of what the "outside" world seems willing to accept. In this way, you will be offloading a major portion of the Limitation Programming that you accepted when you were young, being supremely dependent upon those in whose homes you were raised. You will "become as little children" again, and you will begin to enter the Kingdom of the Expanded Self. As we shared in Trans-Portals 1, all disease is the result of being stuck in various Energy Gates as you are seeking to travel from one state of being to another. Realize, therefore, that there is a vast difference between "seeking to travel" and traveling. Do you know what we mean here? If you want something, you WILL go and get it. If you don't want it, you will not. End of story. True healing comes when you learn to cease giving yourself conflicting messages. It has been written that........ "you will know the truth, and the truth will make you free." We heartily endorse this principle. And, if this message resonates with you as well, then it would naturally follow that he who is not free does not yet know the truth......even though he thinks he does. Instead, he has built his world upon a fake premise, and continues on in chains until someone comes to release him. We are here to assist you, as you step out of whatever "holding cells" you have created for yourself. The time is now. Do you agree? If so, then realize that TRUE DESIRE will become your inquisitor and the purifier for all intentions and opportunities that seek to enter your space. As they present themselves to you, and seek admittance, ask yourself......."Do I really, really want this?" Moreover, does opening this "attachment" resonate with what you recognize as your signature vibration? If not, it is a virus. Delete it. Let it go. You might ask: "How do I know if I really want something?" You have it backwards. FIRST, you know. THEN, you know how you know. Thinking was never meant to be part of your process of universal design. It is great for reminiscence, but has no place in moving forward in the daily journey. If you can still consciously deliberate, and believe you understand everything that is happening to you now, you are vibrating too slowly! The very purpose of Energy Activation in this current universe is to help you to STOP THINKING SO MUCH, and START LIVING. Channel your life! Let it come through! It will be allright. There are "levels" of you that have been planning this unfoldment since the foundations of time. Trust that. It is moving from "knowing," rather than "believing" or "thinking," that makes it possible for you to traverse these Portals. Humans have the innate ability to reason themselves, logically and neatly, right into virtual prison. However, if you catch them off guard, and force them to COUGH UP what it is they really want, right there and then---they often will reach for their magic ring, and change forever. Now. Now is the timing to your Journeys of Discovery. The tides are rising as we speak. Hop aboard the next wave, and off you go! Believe where it is you "seem" to travel, and believe what it is that "seems" to help you return. In truth, each "piece" of your journey joins with all others to create the very fabric of your existence. And, it is these very "seems" that bind the fabric together to form your symbolic Coat of Many Colors. Sew its seams, and so shall it ever be!